3rd: Treat yourself…to a break – What’s your “easy cook” meal? That you make when you can’t be bothered to cook much? I am off to Melbourne today until next Tuesday. I am pretty excited about it, I have loads of eating plans. Plus I will be celebrating my birthday down there as well! But I have been super organised, so I will still be having MoFo posts going out daily. Hurrah! Exhausted? No energy? Maybe not feeling great? But feeling the pangs of hunger? Look no further - peanut butter toast to the rescue! Toast in general is great, and Stuff On Toast is even better. But when even making fancy toast seems like too much effort, you can easily open a jar of peanut butter and be done with it. Though I generally like to add a sprinkle of cinnamon. Sometimes, normally before yoga on a weekday, I like to bulk up my PB and toast with some mashed bananas and blueberries (when they are in season). Excellent fuel for 90 minutes of bikram yoga! Normally I prefer a nice wholegrain bread, but sometimes life gives you amazing banana bread. Which is also an acceptable vehicle for toasting and spreading with peanut butter. The great thing about Peanut Butter is that, on its own, it is already perfect. Peanut butter is life! However, it also goes with pretty much anything you can think of! Except butter. I draw the line there. But anything else, it will go wonderfully! Jam, agave, Vegemite, cheese, grated carrots, cucumber, olives, scramble, roasted or sauteed vegetables, seeds, chocolate.. Give it a try and see! Or don't, just eat peanut butter on toast. Today's inspiration is all about keeping it simple after all! 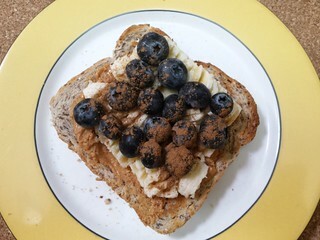 What is your favourite toast topping? What other things do you like to eat with peanut butter? 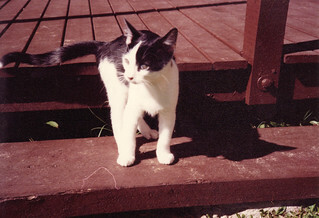 My third cat was Patches, named obviously for his patchy colouring. He was the kitten of a cat who belonged to a teacher at my school, and we went to meet him when he was just teeny and tiny. This photo is of him as a teeny and sassy kitten, but he grew into a huge and magnificent fellow! Ah, I had a Patches too! She was a calico, and she lived about 25 years! Best cat ever. 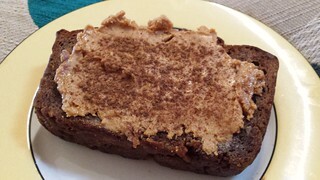 PB toast is the best, and now I think I might have some before yoga today. Happy birthday!! Peanut butter is an excellent pre-yoga snack, just as long as I can eat it at least an hour an a half before getting in the hot room! There's definitely a reason this is a classic dish! I can;t imagine ever turning it down. you are speaking my language with peanut butter on toast - apparently when I went to my best friend's place as a kid they always made sure they had a jar for me (I learnt this when I was older). My daughter is allergic to peanuts so I don't cook or bake with them but I have to be able to have peanut butter - the fresher the better. I used to love peanut butter in a salad sandwich at the food coop at uni and sometimes love it with slices of tomato and black pepper but mostly by itself with fresh bread. I love the sound of it on banana bread too! It is great on salad sandwiches. I like you tomato and pepper idea as well. Glad you are still getting your PB fix! I love savory toast with some sort of bean purree and veggies. Like I love the edamame-pea spread from Protein Ninja, and just regular old hummus is awesome too. I love the look of the Protein Ninja toast chapter. Almond butter is so expensive here! So it is good that peanut butter is my preferred choice.